Migration from Central America to the U.S. began rising notably in the 1980s, and continued to increase in subsequent decades. More recently, the number of immigrants – lawful and unauthorized – from the three Northern Triangle nations rose by 25% between 2007 and 2015. During that same period, the immigrant population from Mexico, the largest birth country for U.S. immigrants, declined 6%. The overall U.S. immigrant population rose 10% during the same period. Altogether, the 3 million immigrants from the Northern Triangle were 7% of the U.S. foreign-born population of 44.7 million in 2015. This Northern Triangle growth included increases in the number of both lawful and unauthorized immigrants. From 2007 to 2015, the lawful immigrant population from El Salvador, Guatemala and Honduras grew 24% and the unauthorized immigrant population grew 26%. By comparison, the national lawful immigrant population increased by 19% from 2007 to 2015, and the unauthorized immigrant population declined by 10%. Immigration from the Northern Triangle has helped to expand the origin populations from these three countries. Including both immigrants and the U.S. born, the number of U.S. Hispanic residents with origins in the three Northern Triangle countries rose even more sharply (46%) from 2007 to 2015. This total includes 1.2 million U.S.-born children with family origins in these three countries. Although the U.S.-born components of these populations are growing rapidly, at least six-in-ten U.S. residents of Salvadoran, Guatemalan or Honduran origin were immigrants in 2015, compared with 53% of those with other Central American origins (Belize, Costa Rica, Nicaragua and Panama). A third of Mexican Americans (33%) are foreign born. By comparison, 14% of all U.S. residents were foreign born in 2015. Among all U.S. immigrants, one-in-four (24%) were unauthorized immigrants in 2015, according to Pew Research Center estimates. Among those from the Northern Triangle nations, a majority were unauthorized immigrants – 51% from El Salvador, 56% from Guatemala and 60% from Honduras. The share of unauthorized immigrants from other Central American nations (27% in 2015) was closer to the overall U.S. share. The number of U.S. unauthorized immigrants from Northern Triangle nations has risen since the 2007-2009 Great Recession, and the three Northern Triangle nations rank among the top countries for the size of their unauthorized immigrant populations. In 2015, there were about 725,000 unauthorized immigrants from El Salvador, 550,000 from Guatemala and 375,000 from Honduras. By contrast, the total number of U.S. unauthorized immigrants, 11 million in 2015, is 10% less than in 2007 and has ticked down since 2009. The number from Mexico, the largest birth country for unauthorized immigrants, has declined notably from 6.4 million in 2009, to 5.6 million in 2015. Several hundred thousand unauthorized immigrants from the Northern Triangle have received temporary permission to live and work in the U.S. under two federal programs with uncertain futures. About 195,000 Salvadorans and 57,000 Hondurans are estimated to be protected from deportation under Temporary Protected Status (TPS), a program that allows relief based on natural disasters or other catastrophes in their home countries. In order to qualify, they must meet residency and criminal-record requirements. The U.S. government’s current designation of immigrants from El Salvador as eligible for Temporary Protected Status began in 2001, based on a series of earthquakes in that country that inflicted widespread damage and killed more than a thousand people. For Honduras, TPS eligibility began in 1999 based on Hurricane Mitch in 1998, which killed more than 5,600 people and displaced more than a million. The Temporary Protected Status permits are set to expire July 5 for people from Honduras, and March 9 for people from El Salvador. The presidents of both countries have asked the U.S. government to extend the temporary program. The administration is required to state 60 days in advance whether it intends to extend or terminate the protected status, and protection automatically extends for six months if such a notice is not published. In advance of the government’s decision, Secretary of State Rex Tillerson reportedly submitted a required assessment in which he said that home-country conditions no longer necessitate protected status for immigrants from Central America. Although some TPS recipients may be in the U.S. on valid temporary visas, Pew Research Center assumes that nearly all immigrants with TPS are in the country without authorization. The program, created by President Barack Obama with an executive action signed in August 2012, provides a two-year renewable work permit and protection from deportation to unauthorized immigrants who came to the U.S. before age 16 and meet certain other conditions. President Donald Trump has ordered that the program be phased out, unless Congress passes legislation to extend it past March 5, 2018. 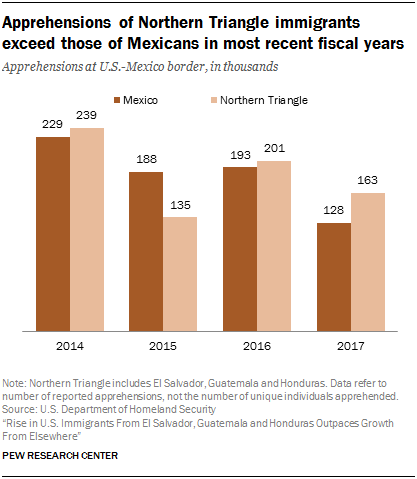 In addition to the rise in the number of Northern Triangle immigrants living in the U.S., government statistics also show a recent increase in migrants from the three nations apprehended at the border. In fact, according to U.S. Customs and Border Protection statistics, apprehensions of Northern Triangle immigrants outnumbered those of Mexicans at the U.S. Southwest border in fiscal 2014, 2016 and 2017. The law enforcement agency says fiscal 2014 was the first time that apprehensions of Central Americans outnumbered those from Mexico. About 99% of Central American apprehensions that year were of immigrants from the Northern Triangle. Mexicans continue to be the majority of those deported by U.S. border authorities, but the three Northern Triangle nations ranked second, third and fourth for deportations in fiscal 2016. In fiscal 2016, about 34,000 Guatemalans, 22,000 Hondurans and 20,000 Salvadorans were removed. Together they accounted for about a fifth (22%) of deportations by U.S. Department of Homeland Security officials. About 245,000 Mexicans were deported, or 72% of removals. People turned back at the border or held in immigrant detention centers are not included in U.S. Census Bureau immigrant statistics. However, the census data analyzed in this report could include migrants who are detained and then released in the U.S. while their cases are adjudicated, though it is not possible to differentiate them from other migrants in the data. Beginning in fiscal 2013, a rising number of unaccompanied children were apprehended at the U.S. border with Mexico, according to U.S. Customs and Border Protection data from the Department of Homeland Security. The number from the Northern Triangle peaked at 51,705 in fiscal 2014. In the 2017 fiscal year, there were 31,754 apprehensions of children from El Salvador, Guatemala and Honduras. Migrants from El Salvador, Guatemala and Honduras also drove a surge in apprehensions of family groups – children and their parents or guardians – in 2016. According to Customs and Border Protection data, there were 71,145 family apprehensions of Northern Triangle migrants in fiscal 2017, compared with 2016’s total of 70,407. Some Northern Triangle nations rank among the top birth countries for new U.S. lawful permanent residents, according to U.S. Department of Homeland Security statistics. In 2015, El Salvador ranked ninth among countries for the number of green cards issued to people born there, and has ranked in the top 14 since 2006. Guatemala ranked 22nd in 2015, and has been in the top 28 since 2006. Honduras ranked 28th in 2015 and has been in the top 40 since 2006. 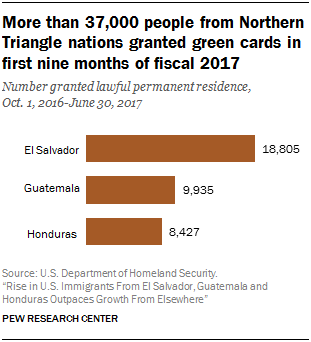 More than 37,000 immigrants from the three Northern Triangle nations were granted green cards, giving them lawful permanent resident status, in the first three quarters of the 2017 fiscal year (Oct. 1, 2016, through June 30). A total of 18,805 green cards were granted to immigrants from El Salvador, most of them (11,620) new arrivals rather than people already in the U.S. adjusting their immigration status. A total of 9,935 green cards went to Guatemalans, about half of whom (5,003) were new arrivals. For Hondurans, 8,427 green cards were granted, but less than half (3,853) went to new arrivals. Among all 845,951 immigrants who obtained lawful permanent residence in the first three quarters of fiscal 2017, about half were new arrivals and half were people already living in the U.S. who adjusted their status. Most Northern Triangle immigrants are admitted because they have relatives already living in the U.S., as is true of immigrants overall. Only a small number of lawful immigrants from Northern Triangle nations arrive as refugees – 974 from El Salvador, 50 from Guatemala and 93 from Honduras from Oct. 1, 2016, to June 30, according to Department of Homeland Security statistics. A total of 49,232 refugees arrived during that time. 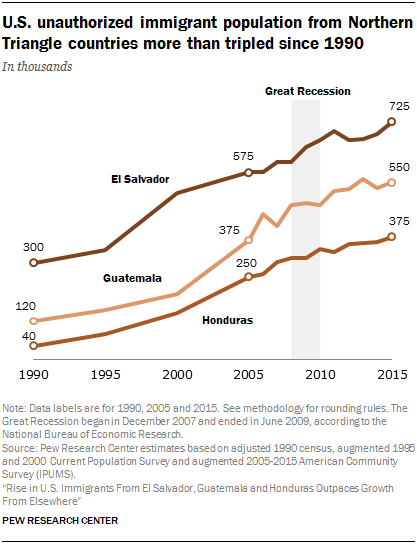 Asylum applications from people born in El Salvador, Guatemala and Honduras have risen sharply in recent years, according to U.S. government data. There were more applications in fiscal 2013-2015 from the three nations than in the previous 15 years combined, according to data from the U.S. Department of Homeland Security. The three Central American nations accounted for 37% of all asylum applications filed with two U.S. government agencies in fiscal 2015 and 2016. That amounted to 112,151 applications. In fiscal 2014, 24% of asylum seekers came from the three Northern Triangle nations. Partial data for fiscal 2017 also show that 37% of applicants – 79,571 of 215,213 – came from the Northern Triangle. Numbers are available for the full fiscal year (October 2016-September 2017) from the Department of Homeland Security’s Citizenship and Immigration Services, which handles “affirmative” applications from those in the U.S. Numbers are available through May 2017 from the Justice Department’s Executive Office for Immigration Review, which handles “defensive” applications from those in removal proceedings.